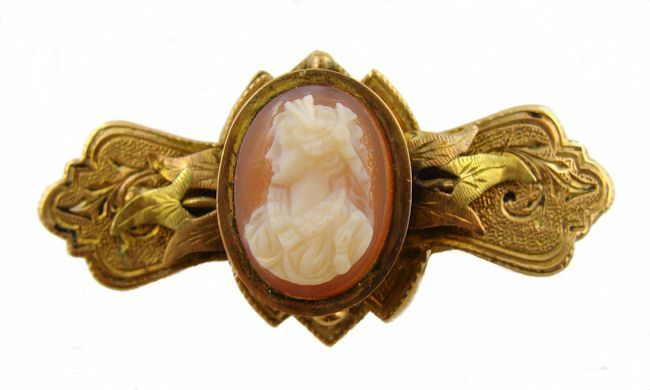 Description: An antique 10k two tone rose and green gold mauve cameo bar brooch. The etched frame was originally yellow bloomed gold over rose gold with green gold ornamental leaves. 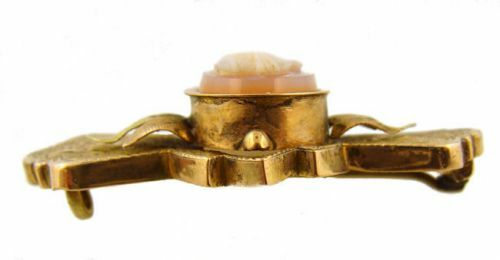 Has a c-clasp with T shaped base metal pin stem. The cameo measures 15 x 11mm of an Elizabethan lady facing left carved in 2 layers of banded onyx (chalcedony) white and mauve. Unmarked but electronically tests 10k. Circa. 1880's. Measurements: Measures 1 3/4" in length by 1/2" in width. Condition: Excellent condition on the cameo. 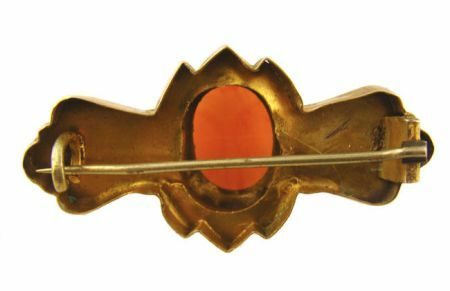 The brooch frame is in good condition with the yellow gold bloomed surface worn off to show the rose gold surface. Also the black enamel tracery is completely worn off and only minute traces are noticeable under magnification. None of the a fore mentioned detracts from the look or the cameo.